For some reason, since I've been reading romance novels, smugglers, like pirates, have been romanticized and are usually the hero of said romance novels. I think it’s the bad boy phenomenon. Contrary to these stories, however, smugglers, like pirates, were rarely good people. Usually, they were quite awful. Any country with a lot of coast and a lot of taxes on imports is going to foster smuggling. England is no exception. England during the Napoleonic wars, saw an inordinate amount of smuggling because of so many goods simply not being available from continental Europe because of the war. People still wanted silk and brandy, lace and leather and wine. On the French side, English wool was heavily prized, along with some manufactured goods. The British might hate the French, but patriotism ceased when their luxury goods were denied to those who'd been able to afford them and lured those who couldn’t afford but wanted them. Therefore, smugglers enjoyed a lucrative trade from one side of the Channel to the other. Cornwall was no exception to this rule. In fact, Cornwall has more coast than other English counties. It sticks out between the Irish Sea and the English Channel, pointing its way into the Atlantic ocean with sea on three sides. Added to that, these coasts boast numerous creeks and inlets in which smuggling boats can hide. Best of all, the north coast of the county is riddled with caves. These caves are a rabbit warren of corridors and rooms, some carved by millennium of sea water eroding the granite, limestone, and other materials forming the rock, but also man-made passages from centuries of mining tin and copper. Between a rather inhospitable coastline and a sea too immense to police with any effectiveness before radar and other technologies, smugglers could operate with impunity for years, decades, and sometimes a lifetime. They operated small, fast vessels they could run close to shore, sometimes even close enough to run right into a cave at high tide. Goods were offloaded and then hidden away in the caves before light. Morning found these men, women, and sometimes children, tucked up in their beds and nothing to show for a night’s work save a packet of duty-free tea on the back stoop of the landowner who allowed his beach to be used for landing. S) he makes out the smugglers to be mostly harmless locals trying to survive in hard times. In many ways, he was right. But the smugglers in Jamaica Inn by Daphne DuMaurier are more likely a correct interpretation, at least when it came to the leaders–dangerous and somewhat evil men with greed on their minds. Because the penalty of smuggling was anywhere from jail, to transportation to a penal colony like Australia, to hanging, smugglers kept their illegal activity secret. They carried a code of don’t ask and tell at your own risk of death. If you snitched, you, or more likely, your family would suffer things like having one’s house burned down or even your family and/or yourself murdered. Yet it was a risk most inhabitants of poor areas took in order to feed their families or enjoy a little comfort in the lean months of winter. When mines closed, which was happening far too much in the Regency era, other jobs didn’t exist. Cornwall is a harsh and inhospitable land for farming. Fishing helped, but that, too, dried up at times. In the lean times, authorities often turned a blind eye to smugglers. Sometimes the promise of free brandy, perhaps a length of silk for their lady, and cold, hard cash encouraged the “riding officers” (revenue or excise officers) to ignore the smuggling in their districts. At other times, however, an ambitious officer determined to catch the local gang and make a name for himself. Rarely did these encounters end well, and the smugglers weren’t always the losers. 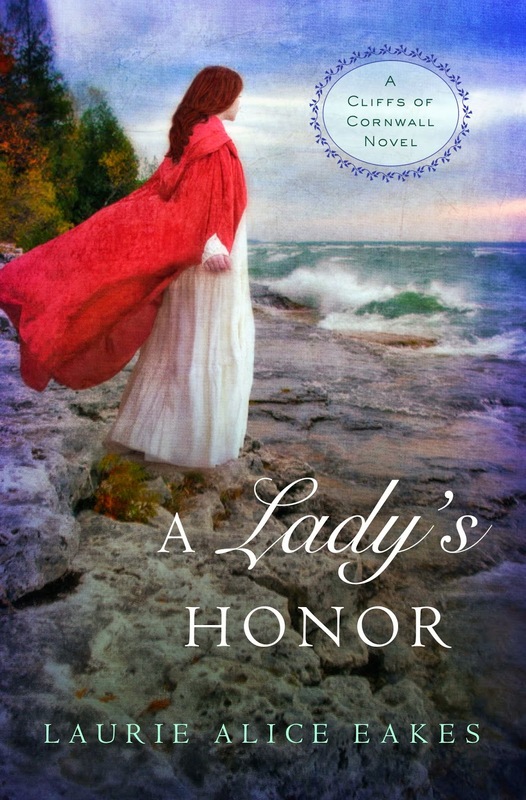 Against this background of secrecy, murder, and greed along the north coast of Cornwall with all its cliffs and caves, rocky beaches and pounding surf, I set my next book, A Lady’s Honor, Zondervan/HCCP, April 22, 2014. So what do you think? Was smuggling to feed one’s family ever justifiable? Smuggling wasn't the only problem in the West Country, as its known, there was also Wrecking, which as it suggests involved pillaging the cargo from wrecked ships, or even at times luring ships onto rocks to deliberately wreck them- and even drown the crew in the process. Got a review copy of this and hope to start reading it soon. One thing though- England and Britain are not synonyms for the same country- there is a difference! Bookish is correct. I'm British, but not English. I cover wrecking in the second book in the series, A Stranger's Secret. Found some intersting original sources. As to England and Britain not being synonyms, to most Americans they are, and my audience is primarily American. Same with UK. Most Americans don't appreciate the differences and I could do a whole post on what they are, and not many of my readers would care or remember. So I use the langue they understand. I understand that, and I don't have an issue with American characters in a novel, however, I think its unrealistic to have British characters using the terms synonymously. It would be rather like having a Canadian character calling themselves American. Its a matter of accuracy with me, and it may be personal, but I think I sometimes rather enjoy learning the terms and idioms used by people in different cultures and countries. Smuggling is controversial. I think when it is purely for financial gain it has some serious moral issues.